Instead of hosting a houseful of relatives and serving a big ham, we started a new, more relaxing Easter tradition this year -- waffles for breakfast. During triangle pose in yoga class this morning, DH whispered to me, "I really want waffles today." Not being a big fan, I was pretty unenthusiastic, but then realized I could make the batter from a vintage recipe in my collection -- and then blog about it later. Kinda like having my cake and eating it too. 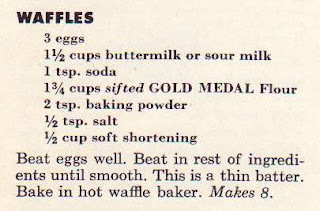 I found a recipe in the Gold Medal Flour Jubilee pamphlet, which takes recipes from 1880 onward and "modernizes" them to 1955 standards. 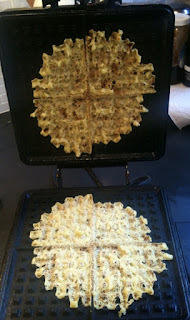 The waffle recipe was in the 1900 to 1910 section -- the same decade the New York City subway opened (1904) and Commander Perry reached the North Pole (1909). The batter was very easy to make, but certainly not thin as the recipes said it would be. The tricky part involves the waffle iron -- Is it hot enough? Is it too hot? Should I spray it with oil? 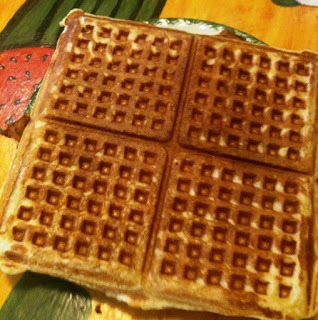 Should I open to see if the waffles are done -- and risk ruining them? We had a couple of sticky disasters (see above) to start and then DH figured out the right timing. The last two batches were waffle perfection: a slightly crunchy exterior with a smooth, almost "eggy" center. The Gold Medal pamphlet helpfully told the story of the creation of waffles: During the Crusades, Lady Ermintrude greeted her knight with some special oat cakes. He accidentally sat on a cake, smashing it flat and leaving its surface marked with the pattern of his armor. She feared the cake was ruined, but he ate it anyway and was thrilled that the indentations caught and held the butter. According to this tale, Sir Giles was so delighted that he put on his armor every Friday night and sat on the cakes. Next year, I'm buying a suit of armor for my knight to avoid waffle iron anxiety (now listed in the DSM, by the way) and enjoy an even more peaceful holiday. Margaret: You've outdone yourself! Very funny indeed. And you're right, more research is definitely called for.